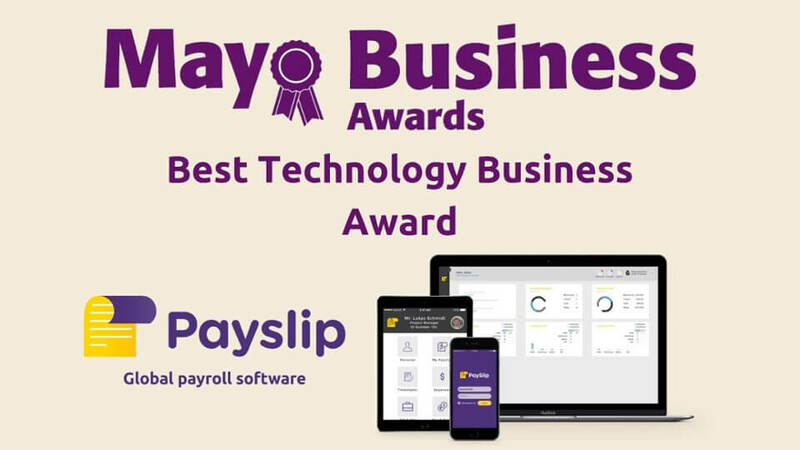 Payslip, the global platform that automates the management of international payroll, has been announced as one of the finalists of ‘Best Technology Business Award’ in the Mayo Business Awards 2018 alongside Westnet & Oceanwave Solutions. The Mayo Business Awards are a cross-community initiative supported by the Mayo Chambers and other local business organisations with the backing of the Local Enterprise Office Mayo and Mayo.ie. The objective of the Mayo Business Awards is to help businesses grow their networks, lift their profile and open the door to new opportunities and possibilities while also giving local businesses the opportunity to be recognised for their dedication, investment, accomplishments and hard work across several award categories. Payslip is one of three technology companies to have been shortlisted for the award in the ‘Best Technology Award’ category. Finalists for this award include Westnet and Oceanwave Solutions. Overall, there are twelve categories including awards for most innovative product and service business award, micro enterprise business award, best tourism business award, manufacturing or export business award, food or beverage product award, best professional services award & best business startup award. This year 47 finalists have been chosen under the twelve categories. Finalists include Dynamic Safety Solutions Ltd, Connacht Whiskey Distillery, Agri-Spread International, Drioglann Loch Measc Teo, Ezewarm Ireland Ltd., Lavelle’s Life Pharmacy, People Matters HR Ltd & Skillko Limited. The winners of the Mayo Business Awards will be announced at the awards ceremony on Friday 9th of November at the Broadhaven Bay Hotel & Leisure Centre, Mayo. For more information on the awards visit the Mayo Business Awards Website.